The Colorado Avalanche have signed restricted free agent forward Nathan MacKinnon to a seven-year contract worth $44.1 million. The team announced the contract on Friday. The MacKinnon contract runs through the 2022-2023 season and carries an average annual value of $6.3 million. The 20-year-old was third on Colorado in scoring in the 2015-2016 season, finishing with 52 points – including 21 goals and 31 assists. MacKinnon is capable of making big plays for the Avalanche and the team has ensured that he’ll be doing that for years to come. He’s a tremendous skater with a great skillset and he’s already shown some serious hands in front of the net. 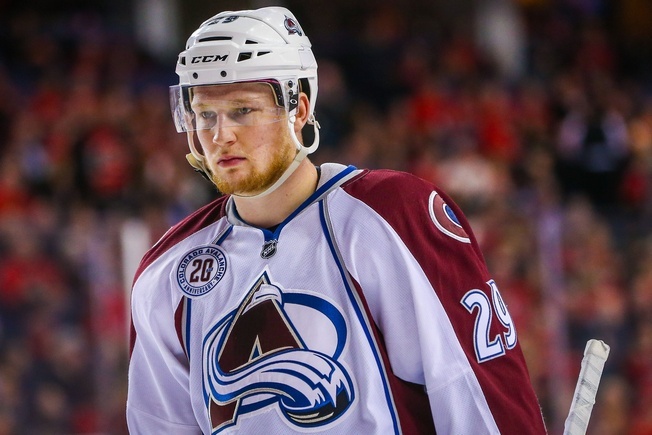 MacKinnon’s versatility is also worth discussing, as he can slot into any situation and excel. Colorado drafted MacKinnon first overall in the 2013 NHL Entry Draft. He secured the Calder Trophy the following year and became the youngest player to win the award. He was named to the NHL’s All-Rookie team, finishing his debut season with 63 points in 82 games. Production slipped the following season to 38 points in 64 games, but MacKinnon looks to be getting back on track. Indeed, the youngster from Halifax has hit the big time and this contract brings some serious pressure with it. He’s entering his fourth NHL season and expectations are high that he’ll hit the next level of his career, even after a knee injury cut his previous seasons short by 10 games. And the Avalanche have missed the post-season two years in a row, so they have their work cut out for them.